This Apaporn Kornthip movie page contains 4 records. A young poor lady Oi is leaving Bangkok and finds her-self adopted in a farmer family lead by a strong mother with her three sons. She is the new daughter. Many funny situations happen as the three sons are fond of Oi. 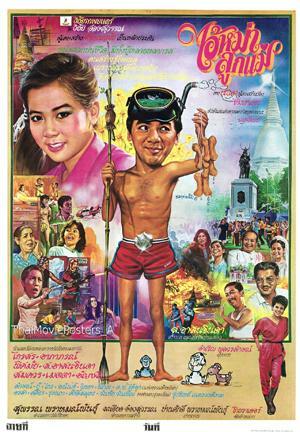 Thai movie ไอ้หม่าลูกแม่ was released in year 1984 and lasts around two hours. The TV cable version lasts 1h40mn and the VHS version lasts 1h42mn. They include various different sequences so the original movie should last around two hours. Sor Asanajinda is movie director. This movie is a drama comedy movie. This movie features many actors and actresses including ด.ช.ไอ้จุก (แห่งขวานฟ้าหน้าดำ), ศศิธร, รุ่งนภา กลมกล่อม, ศักดิ์สมุทร, วันชัย วันเพ็ญ, new actress รุ่งทิพย์ เนตรวงศ์งาม. Father Nio (Somkuan Krajangsat) is married to Yui (Pissamai Wilaisak). They have two children, i.e. a daughter called Nuan (Orasa Isarangkul) and a boy called Neun (ไกรสร แสงอนันต์). Nio is very avaricious and complains that his wife is doing temple donations too often (ทำบุญ). Another family has lady See (Metta Roongrat) as family leader. She has two children i.e. Oi (Lak Apichat) and Pae (Apaporn Kornthip). Neun is going to temple fair with Pae. See wishes her daughter Pae to marry Boo (Boo Wibunnan), a rich but old bachelor. The two families are always in conflict so a wedding between Neun and Pae is a challenge to happen. Sor Asanajinda and Malee Wetpraseri visit relatives with their daughter Kaet (อัญชลี ชัยศิริ). Kaet (นางฟ้า) shall stay in countryside a few months as she is pregnant... Pae is also pregnant with Neun. Father Nio refuses to pay the dowry (สินสอด). See asks for 10,000 THB. Nio only offers 1 baht! Finally, Yui steals 5,000 THB from her husband. Oi steals 5,000 THB from his mother See. So, wedding can happen. But due to Nio and See conflicting, it fails and both Neun and Pae are chased away from their families as they stole money from their parents. Thanks to a recommendation, Neun finds a job by working for Pipop Pupinyo. Kaet goes back for Bangkok and leaves the child behind. As there is a need for money to pay for house windows, Neun asks Pipop for money advance. His wife agrees but she asks for endearment from Neun. Pipop comes back home and fighting occurs with Neun. The wife tries to interpose and gets stabbed by accident. Pipop accuses Neun of having murdered his wife. Neun must flee. Pae and Neun's child is born. Krai (Krai Kanchit) and Pipop commit burglary and murders under the name of Neun. See, Pae's mother, is indebted by playing cards. See and Oi arrange a wedding with Boo. They lie that Neun has a new wife to convince Pae. It makes Neun upset. วิทยา สุขดำรงค์ recommends him to calm down. Neun needs to flee police called by Oi. Neun takes refuge in Bangkok in Kaet's family as a car driver. Kaet's husband, Anoon (อนันต์ สัมมาทรัพย์), has another wife so Kaet is heartbroken and Sor recommends her to build a new life (ตั้งต้นไม้). Oi sympathises with Kaet's husband being a teacher. หมอเสน่ห์ is hired by Pae's family so Boo fires them. A romance between Kaet and Neun happens. Grandma Malee doesn't accept it. Nio is killed by Krai following an external affair. Yui's house is burgled. Neun arrives too late but hopefully Nio's money was well hidden. Neun meets Pipop and Krai fleeing after the robbery. They finally shoot each other unable to share the money. Yui, Neun's mother, sends a parade to ask for Kaet's hand. Neun gives 100,000 THB as promised for Kaet's hand and builds a big house on the land given by Sor. During a drinking session, Anoon discloses to Oi, that Neun is a stupid countryside man as he is marrying Kaet while both of her children are from himself! Despite having university diploma, Anoon behaves badly and the diploma has no value (กระดาษชำระ) as it didn't teach him to behave correctly in life. Informed by Oi, Neun keeps drinking and meets Pae, working in a club as partner. Pae ended up as Prostitute (กะหรี่) and lost her childcare. Anoon even receives 100,000 THB from Sor to keep quiet. Anoon gets beaten by Neun but is only worried about the money. Upset that Kaet lied to him (หลอกลวงเขา), Neun burns the new house (ไฟไหม้เรือนหอ) and surrenders to the Thai Police. Before being arrested, Neun asks Kaet to give money to Pae every month so that she can stop working and take care about their child. This movie highlights poor people versus rich people. Poor people have better heart than rich people. Boonleuang is a lady coming from a poor family. She married Cheut coming from a rich noble family (ผู้ดี). Cheut's mother never accepted that her son marries such lady. Boonleuang and Cheut have one son called Sak. Cheut's mother succeeds to convince Boonleuang through moral pressure to let her educate her son in order that he can have a bright future. Following problems with police, one Boonleuang's neighbour entrusts her to take care of her new born daughter, Saichai, and flee with his son, Chai. He is finally caught by the Police. Cheut and Boonleuang also separate later on. Twenty years passed. Saichai meets Sak, a young lawyer, coming from a rich family. Boonleuang warns her daughter not to continue to meet Sak as rich people can become noble (ผู้ดี) thanks to money but can never become good people (คนดี). Sia is another older man interested Saichai but he has financial conflict with Sak. He tries to have him killed by using professional killer. Chai has become a professional killer and also loves Saichai. He tries to force her to become his wife but fails. When trying to kill Sak, he injures Saichai. The former neighbour exits from prison after 20 years and announces to his son, Chai, that Saichai is in fact his sister. This latter ashamed by his former behavior and knowing that Sia has placed a bomb under Sak's car sacrifices his life for his sister to have happiness with Sak. Boonleuang finally learns that Sak is her son. Knowing that Sia wants to kill Sak, she tries to stop him. He refuses. Sia is killed and Boonleuang recognizes she is the murderer. She has to go to trial. Sak is the defense lawyer but Cheut, Sak's father, is the defendant layer to protect Boonleuang. The son against the father. Saichai asks for pity for his mother but Sak refuses to mix love and professional duty. Sak is very harsh against her mother during the trial. The former neighbour acknowledges that Boonleuang only injured Sia but that he is the one that killed him. Sak acknowledges his defeat. Once Sak realizes that Boonleuang is his mother, it is too late, she has died due to deep sorrows. Kaew is a slave at the beginning of 20th century. He has an affair with Kalong, his master's daughter. They love each other and she becomes pregnant. Being aware of the situation, the master beats Kaew every day and Kalong is secretly hidden and kept by the master's servants. One of them, drunk, kills Kalong while she is giving birth. Kalong becomes a ghost and kills those who hinder her. Following the abolition of slavery by Rama V, Kaew quits his master's home and settles in another village where he meets a lady called Sonklin. Love goes beyond death and Kalong searches for Kaew. She finally finds Kaew and stays with him. Kaew ignores that his wife is a ghost. Finally Kalong is recognized as a ghost and wants to kill Sonklin and brings Kaew with her. A buddhist monk has to calm down Kalong so that she accepts her death and wishes to meet Kaew again in their next life. The scenario has many similarities with "MAE NAK" ghost (แม่นาค) story. Same as Mae Nak, there is art of compromise in film ending instead of one party winning. This is part of Thai culture. 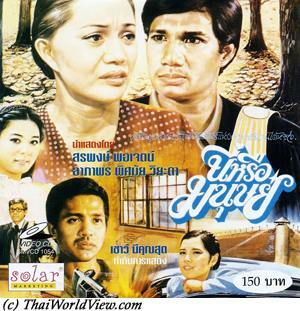 It is a remake of the movie shot in 1967 with legendary stars Mitr Chaibancha and Petchara Chaowarat.